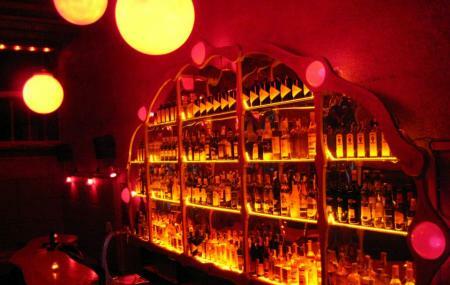 A hidden gem nestled in the back streets of Born, the Rubi Bar is a cosy cocktail bar. Famous for its classic cocktails and mojitos, the bar has a vibrant feel and good music. The highlight of this bar is their gin which they brew themselves in several seasonal flavours and has earned the approval of most gin connoisseurs. The ambience of the bar is warm and welcoming and it is a perfect place for an evening out with friends. The bar gets crowded on weekends and late in the night with tourists and locals pouring in to sample their famous gin and tonic. Dress code is smart and casual and trendy, beachwear is not permitted. The wait staff and bartenders are English speaking making it easier for tourists to place their order. Get here early if you want a seat. How popular is Rubi Bar? People normally club together Palau De La Musica Catalana and Ciutadella Park while planning their visit to Rubi Bar. Very small bar in the back streets of the gothic quarter but really nice. Amazing choice of gin for the gin drinkers & lots of other good alcohol choices. At first: This is a bar where serious drinks are served. They have a selected card with about 20 drinks, from which everyone is unique. Both drinks i had were awesome. The lighting and atmosphere creates a very special mood. A group of friends (i guess) run the bar, and they really care about your comfort. If you are looking for an extraordinary bar, this is the place to be. And: Drinks are from 5-10 euros, which i found crazy cheap for what you get. Definitely coming back! Sister bar of lime house. Love this place! A must visit on all trips to Barcelona. Great gins, music, cocktails and staff.